This stunning selected hammered granite walling stone comes from our Caradon Quarry on Bodmin Moor and is suitable for building masonry walls. The stone has been hand selected from our hammered granite pile to have a nominal bed depth of 100-150mm. 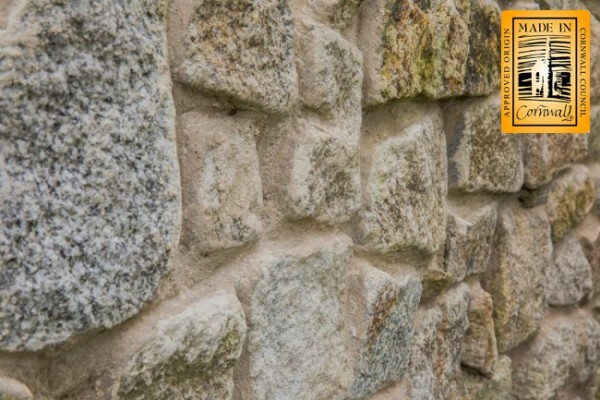 Whats more, it has also had it's backs cropped, to allow for larger stone faces than our standard selected walling. This granite walling stone is a very good match for Dartmoor granite. As our photos illustrate it is possible to use this stone to create a spectacular finish, whether it's intended for use in a small or larger sized project. For delivery on pallets please call us for a quotation. 1 tonne of premium selected brown hammered granite walling stone will cover approximately 3 square metres. Please be aware the price listed above is excluding VAT. The price is for 1 tonne of granite walling stone. Should you require assistance at any stage, whether it be choosing the right product to working out delivery options, our helpful and knowledgeable staff are happy to advise you.